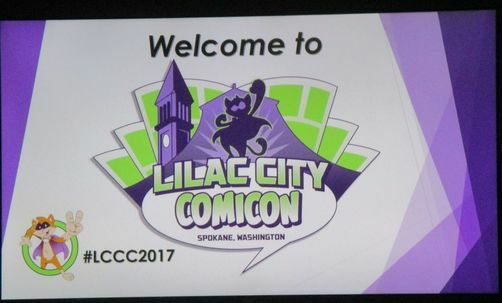 On Sunday June 4, 2017, Cosplayers Jerikandra and Abi Sue talked to Lilac City Comicon attendees about working with different materials for costumes. 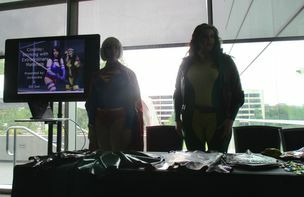 They covered latex, spandex and the use of resin and Worbla in cosplay. Abi Sue says that Worbla is a thermo plastic that can be shaped with heat tools. It is sandable, nontoxic and reusable. It’s also expensive enough that using scraps and figuring out ways to expand its area without having to buy more is important. Whatever you are using Worbla for, you will want to create a paper pattern, make the item from craft foam and put the Worbla over the top of the craft foam. This will allow you to add thickness without adding Worbla. You can either use the fold over method, which uses less Worbla, or you can sandwich the foam between two layers of Worbla, which is harder and less flexible. When you are working with Worbla, you need a craft table or a glass cutting board. If you try to work with it on your carpet or wood floors, you will end up melting or burning them. Be sure that the surface you choose is something that glue won’t stick to. Puffy paints and wood burning tools can be used to add details to whatever you construct out of Worbla. If you are creating a larger piece, you can add snaps, screws or Velcro to create points where you can take your creation apart and make it smaller. This is good for travel and for cosplay weapons that might otherwise arouse suspicion on a plane. Worbla needs to be sealed first. Gesso and sanding work. Some people use 4 layers of wood glue; others use mod podge. After it’s sealed and sanding, you will want to have a primer layer, a color base coat and add details with acrylics. Spray paint for larger areas is fast. A black acrylic-water wash weathers the item. Apply the wash and wipe off, it will leave black in the ridges. Seal it with a clear top coat. Because Worbla is heat sensitive, you shouldn’t leave your costume pieces in the car. They will bend and become distorted because of the heat.